TechShop is coming to SF! So, I'm a real picture hoarder, I spend a lot of time online nabbing images of all kinds of great stuff, including pictures of hats, and I've decided to start a regular feature to share them. Here's my first Hat of the Week! 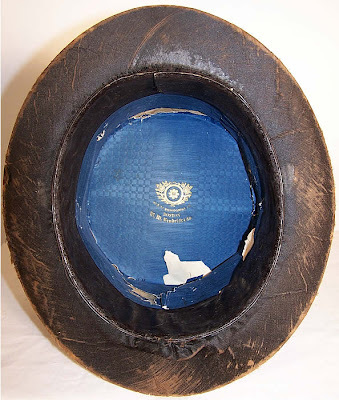 This is a 19th century silk plush top hat. 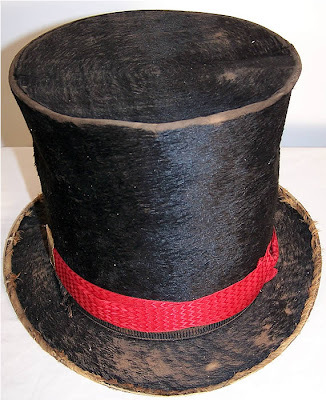 It's a fairly old one, not sure of the exact date but I'd say possibly mid-19th century, because of the straight-sided stovepipe shape, which was popular in the 1850s and 1860s. You'll notice that this hat has an unusual red hat band and a little metal badge. 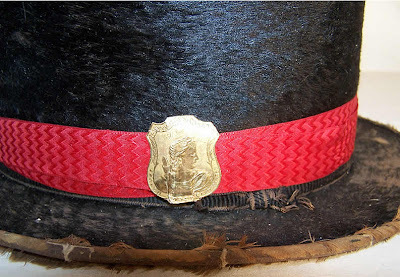 The badge is hard to read in this photo, but it's from an old volunteer fire association, so I'm guessing that this hat was part of a fireman's uniform from the time period. 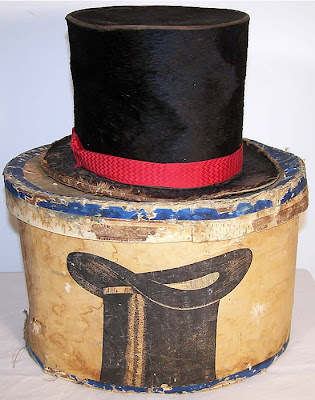 I've seen illustrations of top hats being worn with uniforms during the time, but had never seen a real one before. Through the 19th century, there were no municipal fire departments. All the fire associations were 'volunteer', essentially free agents that kept their own fire houses and trucks and put out fires without government oversight or support. I'm sure that they were usually on the up and up, but in big urban centers they were notorious for looting houses as much as saving them. In New York it was common for more than one fire association to show up at a fire and then engage each other in a fistfight over who got to go into the house first to grab the best of the spoils, as the house burned away un-watered. They depicted this situation in a scene in Gangs of New York. The book that they made the movie from is really great, if you haven't read it you may want to pick it up. The author, Herbert Asbury, wrote true crime books about the 19th century underworld in a number of US cities, they're really good.